The big Whisky Tasting / guest tasting / head to head night is nigh. This all happened last Saturday night round at Dougie’s hoose early in the evening. Round the main whisky tasting table were Jim, Dougie, Nicola and our first guest taster Mr. Douglas (Dougie) Bell our local Longcroft businessman who owns and operates an auto engineering company together with a MOT station and is a well respected company within this area and slightly beyond. This night involved a double tasting (Bowmore’s 15 year old Mariner and Bruichladdich’s Rocks). All of us giving our whisky tasting notes on both, and at the end of the tasting session giving our overall favourite of the two. This night turned out to be a fantastic evening. The Whisky was superb the chat and interaction was second to none. Oh by the way Mrs Jim, Mrs Dougie, Mrs Douglas and Mr Nicola were in close proximity, but their tipples were a mixture of wine, beer, cooking whisky and gin. Although Mr Nicola (Scott) did enter the inner sanctum of the whisky tasting room and did take the odd dram and made one or two comments, but Whisky is not his poison. Colour: we all agreed that is was a deep amber but in a certain light a tint of pink came through. Jim, sweet with a hint of floral fruit. Dougie, vanilla and fermenting fruit. Douglas, (guest taster) woody residues, smokey when water added. Jim, smooth, sweet and deliciously fragrant. Nicola, sweet with a hint of bourbon. Dougie, toast dipped in sherry, robust and full bodied. Douglas, (guest taster) liquorice, caramel/toffee. Jim, long and warming with a touch of dryness. Nicola, long and warming toffee. Dougie, sweet with a hint of smoke, long and smooth. Douglas, (guest taster) dry aftertaste, sweet but musky. 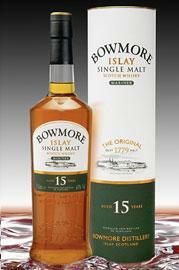 Next was Bowmore Islay Single Malt Scotch Whisky 15 Year Old Mariner. 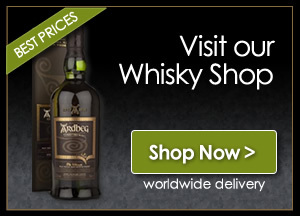 From elsewhere on this site you will see that Islay features quite a lot and Bowmore has been mentioned more than once or twice, from these other articles you can find out a lot more about Bowmore and its great malts. Mariner, we believe is only available from the distillery shop at Bowmore, on line or at travel outlets, (airports ferry terminals etc) if anyone knows where it can be bought locally from, please drop us a line, we will tell the world. Now for the tasting, all the tasting glasses washed and cleaned the table set and the gathered tasters all ready. We as always seem to agree when we discus the colour of our dram and on this occasion it is no different. we all agreed its colour was a fantastic coppered bronze. Douglas, (guest taster) candy floss, peaty, smoke. Dougie, peat smoke and I agree with our guest taster, an Arbroath smokie. Douglas, (guest taster) medicinal, burnt toast, seaweed, Arbroath smokie and warming. Jim, long, robust and very complex. Nicola, tobacco and really not to my taste. Douglas, (guest taster) long smoke finish. Overall another success, but the time came to decide what was the best / nicest / favourite in other words their are two glasses of malt on the table, you are told one is a Bowmore Mariner and one is Rocks which would any of us choose, but you can only pick one of the glasses. The other part of the scoring was that you put you scores in a hat and no one new how each of us scored we got and independent adjudicator (Mr Nicola “Scott”) to tally up all the points and declare a winner. Now for the result, Da Da Da Dum. 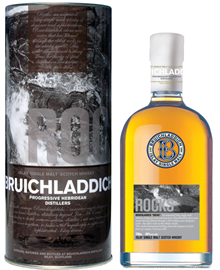 Out of a total points available (40, that’s ten from each of the four tasters) the split went 22 points to Bruichladdich Rocks and 18 points to Bowmore Mariner. Our after taste chat was interesting, no one gave away how they scored but overall we agreed the best dram won, but this is not to say that the Bowmore Mariner was a loser, on the contrary it’s a winner, albeit just behind Rocks on this occasion. Douglas Bell our first guest taster says he had a great night and only hopes to be asked again and again. He also says what a great way to introduce people into the world of fine malt Whiskies, he says if I new it was this good I would have done it years and years ago. Well done the Whisky Boys, thanks for a smashing night, Dougie Bell.